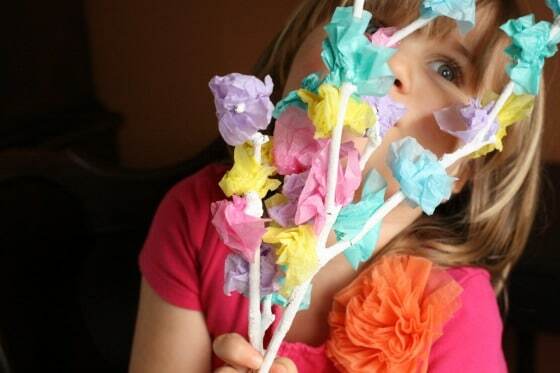 Kid-Made Spring Centerpiece with Twigs and Tissue Paper. Phew! That’s a mouthful, but I couldn’t think of a better name. 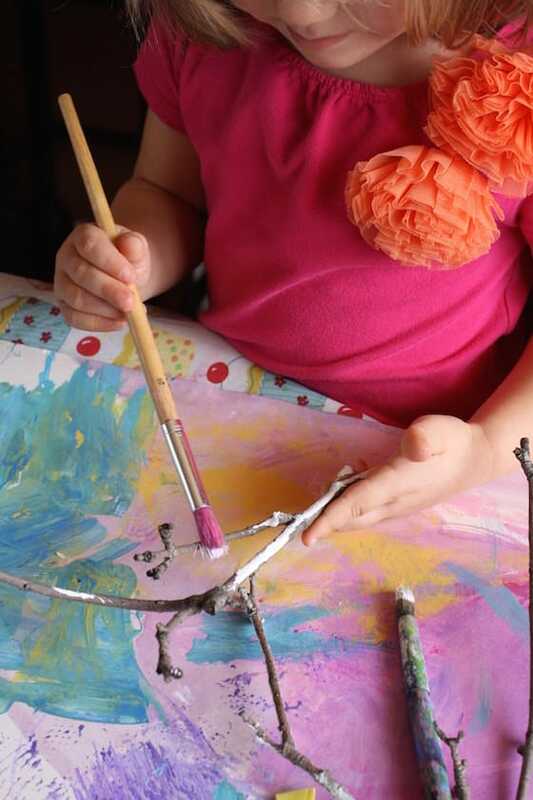 In a nutshell, this is a simple spring craft that preschoolers and toddlers can make using twigs, tissue paper and a few other materials you likely already have at home. We made this this centrepiece for our Easter dinner table, but you could display your decorative spring branches in a jar or vase, or even on a windowsill or coffee table. I’ll bet they’d look pretty suspended from a ceiling or in front of a window too. There are lots of fun and creative steps in making this centrepiece and it all starts off with a play in the yard or a walk around the neighbourhood. We took a walk to a nearby field to look for broken branches and twigs to make our craft. Back home, we removed any obvious pieces of loose bark, and we painted our twigs white. While my helper was painting, I was busy cutting the tissue paper up into 2 to 3 inch squares. When the twigs were dry, I secured a couple of them together with a rubber band. Then my hooligan crumpled the squares of tissue paper, and stuck them all over the white branches. FYI: kids love crumpling tissue paper. 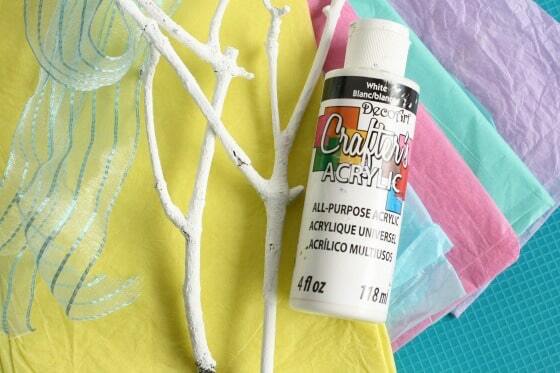 We frequently craft with tissue paper for a couple of reasons. Firstly, it’s inexpensive. Most often it doesn’t cost us a thing because I save any tissue paper that we get in gifts and gift bags. Secondly, the hooligans just love crunching and scrunching it up. It feels great, sounds wonderful, and it’s a super activity for developing those little hand muscles. 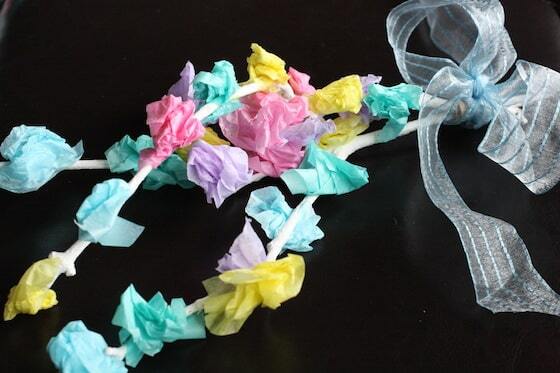 When our spring tree was covered with colourful tissue paper blossoms, I tied a scrap piece of ribbon around the branches to hide the rubber band. 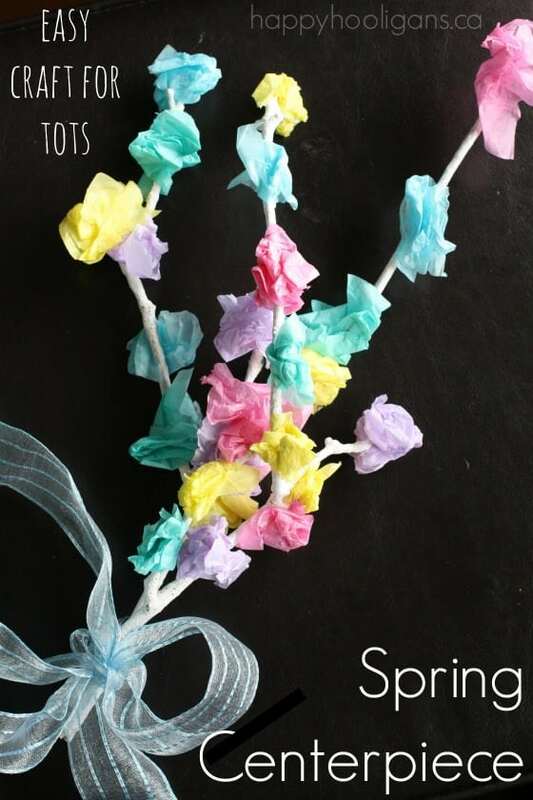 What a lovely decoration for your kids to make for spring! The kids and I did a similar project after Easter. However, we unwrapped all the bright Tin foil covered chocolates from the egg hunts and used those to make colorful flowers/leaves. I chopped the unwrapped chocolates and used it for cookies for the kids and their teachers. The same could be done around Halloween and Christmas. I’m new to your site and continue to be delighted with the treasures I find. Keep up the great work. 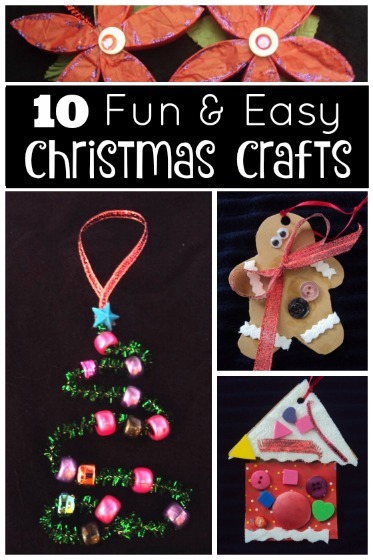 Great idea using the coloured foil, Carmen! 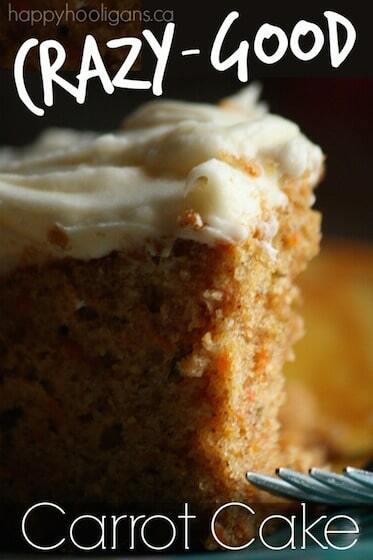 What a great exercise for kids, and a great blog! You’ve provided a lot of good resources for teachers and parents to use with their kids. I particularly like this Easter activity.